Our dietary habits are the bedrock of our physical and mental health, and we can improve our health simply by going back to the basics of that art of living — which is eating. People today no longer know why they eat, or what or how they should eat. Yet eating properly need not be a complicated task. A stress-free approach to food is possible if we know how to listen to our needs and the messages our bodies send us. 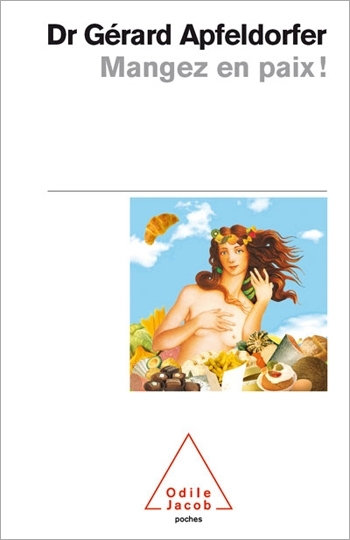 In this book, Gérard Apfeldorfer urges us to rediscover the commonplace yet sometimes complex act of eating. He explains its deeply personal and emotional aspects. He urges us to overcome our fears, to make peace with ourselves and with eating, not to yield to forbidden foods, to realise that there is no ideal distribution of meals in the day, to eat less when our bodies ask for less, to remain faithful to our own food repertoire, to construct our meals with foods we enjoy, and to trust ourselves. The advice he gives here will enable us to find dietary harmony; he argues that eating in peace may well be the first step toward being at peace with ourselves. In this radically new, guilt-free approach to dieting Apfeldorfer breaks with traditional slimming methods. The advice offered here is often in direct opposition to received wisdom: there is no scientific justification for the consecrated three meals a day, nutritional balance is not achieved during individual meals but over the long term, eating between meals and snacking are not forbidden, etc. Also included here are tips on learning to really taste and enjoy food; on rediscovering the pleasure of simple foods; on eating alone or with family or friends; on eating in a restaurant; on selecting food in a buffet. A physician, psychiatrist and psychotherapist, Gérard Apfeldorfer is the vice president of GROS (Groupe de Réflexion sur l'Obésité et le Surpoids), which specialises in eating disorders. He is the author of, most notably, Maigrir c'est fou (2000), Maigrir c'est dans la tête (1997, new ed. 2007) and Les Relations durables (2004), and the co-author, with Jean-Philippe Zermati, of La Dictature des régimes. Attention! (2006).